With New Year’s coming up, and EF College Break’s traveling bloggers posting away on the Stories Tumblr, I’ve been doing a lot of reminiscing about my own New Year’s experiences over in Prague. Fond memories all around. I lived in Prague for two years. So I had two New Year’s Eves. The first was the one I will never forget (to be honest, I can’t remember what I did on the second one). But that first one, yes. I remember it like it was yesterday (it was seven years ago). I’d just moved to Prague a month or so before the New Year, so I was still new to the city. I was training to become an English teacher, and some other trainees and I asked where the center of the New Year’s action was. The answer was Old Town Square. The scene was crazy. The whole square was packed. People were blowing horns, cheering, laughing, partying, and generally bursting with joy. It was a totally free and easy atmosphere, much less regulated than what I was used to back home. People were setting off firecrackers right over the crowd (terrifying and fun at the same time). I had never experienced a New Year’s like it, and I imagine I never will. It's not every year you get to watch the New Year’s stroke of midnight on a clock like this. Anyway, wherever you may be, Happy New Year. Next time do it in Europe. I've spent two or three New Year’s Eves in Europe, so I’m especially looking forward to hearing what they end up doing on the big night. And the rest of the trip, for that matter. They'll be keeping us in the loop every day, from London to Paris to Munich to Venice and everywhere in between. Last I checked (a couple minutes ago), Laura was on the way to the airport with her sister and Nicole was getting ready to board her flight through Miami to Europe. Everyone sounds very excited. I'm excited too. I can't wait to travel vicariously through our EFCB Tumblr bloggers. I will be checking it out multiple times a day. I will most likely never fly on Cebu Pacific Airlines based out of Manila, and I assume many of you never will either. But that doesn’t mean we can’t enjoy their special holiday flight safety dance, performed to the sounds of Mariah Carey’s “All I Want for Christmas is You”. You can watch the airline’s official video here. It's sure to get you in the holiday mood, while also getting you to think about flight safety. This isn’t the first time the crew of Cebu Pacific has danced the flight safety presentation. In fact, their most famous rendition was done to “Just Dance” by Lady Gaga. It became something of a viral sensation last year. A Cebu Pacific spokesperson says they decided to add dance and music to the usually boring flight safety message to get more people to pay attention. I’m all for it. If nothing else, it adds a little color to the beginning of the flight, and it kind of breaks the ice. I like when airlines inject a little humor and lightness to the flying experience, whether it's the flight safety video or the tone of the crew speaking on the intercom. There’s no reason zooming through the air at 40,000 feet should be taken so seriously. I like this story. A small village near the Costa del Sol in southern Spain has just voted to keep all the buildings in town Smurf blue. All 175 buildings in tiny Júzcar were painted sky blue for the filming of the Smurfs movie. Sony Pictures promised to paint the town back to normal after filming (normally the buildings are white), but the people of Júzcar have just voted overwhelmingly to keep it Smurfy blue. I’d like to say it’s because the 221 residents of Júzcar love the Smurfs, but really it’s because they love the money they’re raking in from tourism. Before Sony and the Smurfs came in, the little village would get around 300 tourists a year wandering through. Since the town was Smurfed about six months ago, it has welcomed about 80,000 visitors. Obviously that’s great for the little town’s economy. And it goes beyond the blue buildings. The town has gone Smurf-crazy. They have a Smurf moonlight fun run, Smurf painting competitions, Smurf trade fairs and Smurf-themed weddings. Somehow, the Smurf center of the universe is now in tiny Júzcar, Spain. Getting close in "cuddle class"
I give Air New Zealand a lot of credit for creativity. From the same airline who brought us a flight safety video featuring crew members wearing only body paint, we get “cuddle class”. Basically they’ve outfitted three-seat rows in coach to form tiny little beds for two people to sleep on during long overnight flights. The armrests go up and a special padded footrest panel comes up and locks into place, widening the sleep surface just barely enough to fit two people (cuddling closely). They have to pay about half-price for the third seat. Sounds pretty good to me. Of course, it’s not exactly sleeping in luxury (not that I expect it to be). The rows are still only 4½ feet wide, so you can’t lie all the way flat (unless you’re less than 4½ feet tall). Passengers say it’s kind of like sleeping on someone’s little couch at home. Air New Zealand has toyed with all kinds of other creative seating ideas to make long flights more sleep-friendly. At their secret research warehouse in Auckland, they tested everything from staggered seats, to bunk beds, to seats stacked on top of each other. Testers came in and tried the various options, and the seat-couch was the most popular. So they went with it, installing it on several of their planes. People seem to like it well enough. It might not be long before this is a common option on other airlines’ long haul flights. We may see a lot more in-flight cuddling in the future. Has anyone watched the new TV show Grimm on NBC? I haven’t. But I know that it’s inspired by the famous Grimms' fairy tales, and I love those. There was also that Brothers Grimm movie with Matt Damon a few years ago. I didn’t see that either. Basically I just wanted an excuse today to write about the Brothers Grimm. If you’re taking a trip to Germany, you'll definitely feel the Brothers Grimm vibe as you travel the countryside, visit the castles, and drive through the Black Forest. Many of the famous folktales they're known for took place in the small towns and dark woods of this region. The actual Grimm brothers are buried in Berlin, where they lived the last part of their lives. You can see their graves at the St. Matthäus Kirchhof Cemetery. The brothers were Jacob and Wilhelm Grimm, born in the 1780s in the town of Hanau, near Frankfurt. They were linguists originally, but in 1812 they published a collection of their favorite folk stories called Children's and Household Tales (today known as Grimms' Fairy Tales). We’re talking about all those childhood classics, including Rapunzel, Rumpelstiltskin, Hansel and Gretel and Cinderella. The brothers didn’t write the stories, they just traveled the countryside collecting old folk tales and published them in one volume. Less forgiving people might say they stole them. Maybe so, but I’m glad they did. It’s that time of year again. The time of giving and receiving. As you've probably heard, EF College Break has just released some holiday e-cards. You can send these out to all your favorite gift-givers, reminding them how much you're hoping for the gift of travel this holiday season. If you haven't already seen the cards, you can check them out here. They're great for sending to parents, grandparents, aunts, siblings, eccentric millionaire uncles—anyone who wants to give you something nice and meaningful. If you're already traveling, this is also a great time to pick up some travel accessory gifts. Of course there are plenty of places to find travel gifts online. I’ve done a bit of research myself and picked out some personal favorites. Anyone else have any good ideas for travel gifts? Well here’s an interesting idea. 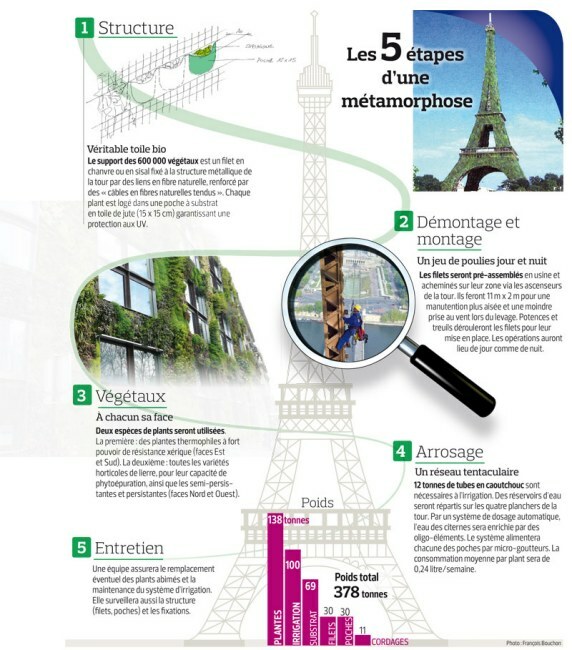 An urban planning consulting company has proposed permanently covering the Eiffel Tower with plantlife. They want to drape the entire 1000-foot tower with 600,000 plants, turning it into a living breathing thing. Like any radical new idea for transforming an iconic landmark, this one takes some pondering. My first thought is that it’s crazy. You can’t cover the Eiffel Tower in plants. But the more I think about it, the more I kind of like the idea. There’s something futuristic about it. The philosophy behind it, according to the company, is to symbolize a reconciliation of nature and humankind as our urban areas continue to grow around the world. That’s a nice concept. Of course at the moment there is nothing official about this at all. The proposal was just reported in the French newspaper Le Figaro. Paris City Hall and the company that runs the Eiffel Tower haven’t endorsed the plan in any way. They say it's not happening. But it's still fun to think about. If it does somehow get the green light, work on the project would start next year. Plants would be added gradually throughout 2012. That means anyone on any Paris trips next summer would see the transformation in progress. It would add an exciting wrinkle to the experience of seeing such an iconic landmark in person. That’s it, I like it. Bring on the plants.